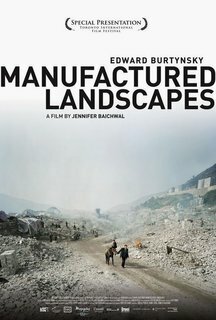 I had the opportunity to view a riveting film last week on Edward Burtynsky's photography, entitled Manufactured Landscapes. The Super 16mm-shot film opens with a tracking shot of the Cankun factory in China's Fujian Province, sweeping across seas of uniformed workers dronely assembling electronics and medical equipment. 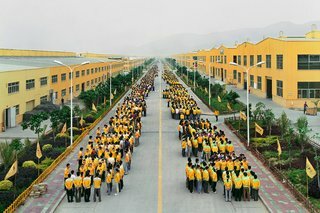 Later, the scene moves outside, where we see the same yellow-clad workers lining up as the factory bosses reprimand them for their inefficiencies, all while standing for Burtynsky's shoot. It was this factory setting that produced his famous "Manufacturing #18" in 2005, pictured above. The film shifts between photography and video almost seamlessly, portraying Burtynsky's experiences in both China and Bangladesh to capture the visceral nature of large-scale infrastructure, quarries, mines, landfills, and specifically China's Three Gorges Dam. In another scene, focusing on the concept of e-waste recycling, Burtynsky depicts mountains of motherboards, wires, smashed monitors in the town of Seguo in Zhejiang Province, and interviews the people affected. Due to this massive influx of poisons, Zhejiang now has a contaminated watertable, and must ship water into the province for its residents. While many praise the film for presenting the evidence of industrialization in such a powerful, yet non-didactic way, Burtynsky's message has, undoubtedly, a pretty directed agenda. 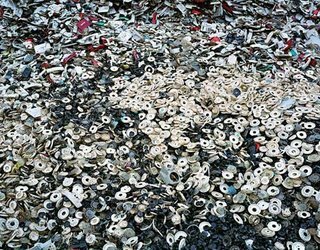 "Maybe the landscape of our time is the one that we can change," Burtynsky muses, as the videocamera flies across an harrowing ocean of discarded phone dials.